The 2009 European Parliament election - the biggest trans-national election in history - is over, after a marathon four days of voting. Final results are not yet confirmed but the trends are clear - a strong result for the centre-right, collapsing support for the centre-left, and a boost for the far-right and other fringe groups. However, out of 375 million Europeans in 27 countries eligible to vote, fewer than half chose to do so, setting a new low for turnout. Some 736 members of the European Parliament (MEPs) have been elected for a five-year term - a reduction from the 785 MEPs in the previous parliament. Voters chose representatives mainly from their own national parties, many of which now join EU-wide groupings with similarly-minded parties from other countries. The centre-right EPP has retained its place as the largest grouping, securing an estimated 267 seats out of 736. The centre-left PES is on around 159, while the liberal ALDE has an estimated 81. This varies according to the country's population. Germany, the most populous member state, has 99, while Malta, the least populous, only has five. However, this number could change during the next legislature if the Lisbon Treaty is approved. The treaty sets the number of MEPs at 751. If ratified, some countries like Malta and Slovenia would gain a seat, while Germany would lose three (although they would not have to vacate their seats until the following legislature in 2014). How do I find out who is my MEP? You can use this part of the European Parliament website . Most people do not have one MEP, but several. Constituencies in the UK have up to nine MEPs each. Do MEPs represent their national party or a European party? 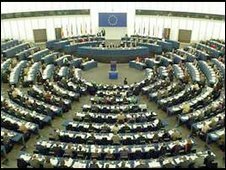 MEPs often represent both a national party (such as the German Christian Democratic Union or the French Socialist Party, say) and a European party (such as the European People's Party or the Party of European Socialists). Some MEPs (such as British Conservatives) only belong to a national party - but even then, they are nearly always a member of one of the European Parliament's parliamentary groups. Groups vote as a united bloc when they can, and have whips whose job is to promote group discipline. However, it is usually the national party which decides whether an MEP is selected to run again in the next election. How does the European parliament affect me? The European Parliament has a considerable influence on the lives of EU citizens, whether they realise it or not. EU laws apply in all member states, and most laws passed by national parliaments are drafted in response to European directives (framework laws that have to be transposed into national law within a certain timescale). 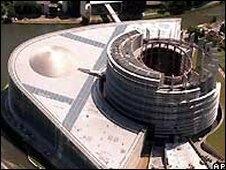 The parliament is the only directly elected body in the European Union. The members of the European Parliament (MEPs) are there to represent citizens, as legislation is debated, amended, and either rejected or approved. Can you give me some examples of EU laws? Reach regulation. This stands for Registration, Evaluation and Authorisation of Chemicals and has been described as the most important EU legislation for 20 years. It puts the onus on business to show that the chemicals it uses are safe. It came into force in June 2007. Roaming regulation. This limits how much mobile phone operators can charge customers for roaming calls in other EU countries. It came into force in summer 2007. Data retention directive. This is a central plank of the EU's anti-terror strategy. It requires member states to ensure that communications providers keep phone records and e-mails for up to two years. It holds regular plenary sessions in Strasbourg, but members of the parliament do most of their work in Brussels. This is where they examine draft legislation in committees. The parliament also has the power to sack the European Commission, the executive arm of the European Union. It holds hearings on new commissioners, and has the last word on about half the spending in the EU annual budget. It is often argued that MEPs have more real power than members of national parliaments, even though they usually have a lower profile. Will my vote change the EU's policy agenda? To a certain degree. It's the European Commission that proposes most European legislation, but the parliament can influence the agenda. If more than half of the parliament passes a resolution calling for legislation in a specific area, the Commission is obliged to respond. Does the parliament alter the Commission's proposals? Legislation is usually amended as it passes through the parliament. The amendments take effect if they are also agreed by national governments. Parliamentary approval is not necessary for all EU legislation, but the Lisbon Treaty - if it ever comes into force - will dramatically increase the number of policy areas where MEPs play a decisive role. What difference will the election make to the rest of the world? Not a huge amount. The European Commission and the Council of Ministers are more directly involved in international affairs than the parliament. However, the parliament does take a stand on issues which affect the EU's relations with foreign countries. It also has a say over the use of the EU foreign aid budget, which is the largest in the world. The EU spends $1.3 billion a month on assistance projects in all five continents. How will election results change EU?